For when you need a quick yet flavorful lunch in Center City. Does anyone eat anything other than grain bowls for lunch anymore? Sure, you can nibble on a wrap or dig into a salad, but there’s something about mixing grains in with your other colorful, satisfying ingredients that makes other options feel inferior. Not all bowls are created equal, though. Some highlight seasonal ingredients while others play around with flavor profiles. Some heap on the toppings while others take a protein-heavy approach. Lucky for you, we’ve eaten our way through many of Philly’s grain bowls to help you find the one that’ll satisfy all your cravings. One of the city’s grain bowl newcomers (although it’s been in a bunch of other states for a while now), Cava takes on the food trend from a Greek angle. 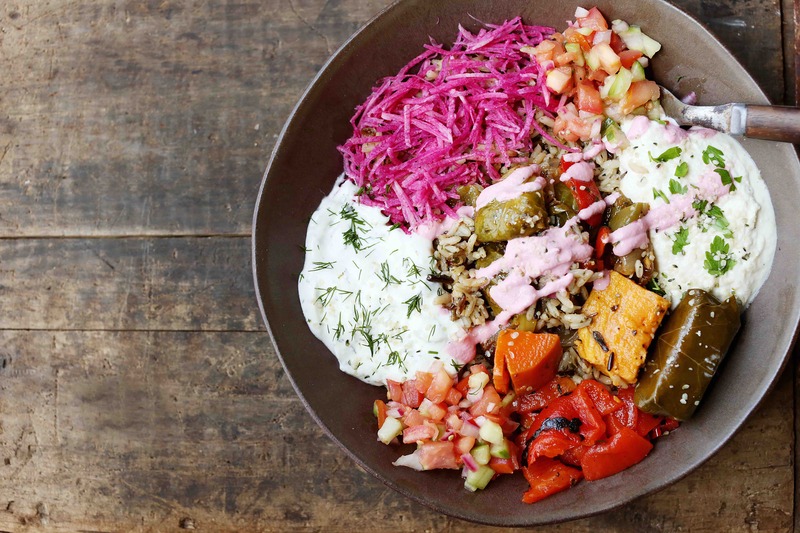 You’d think, then, that its grain bowls might highlight the Mediterranean region’s amazing spreads (hummus, tzatziki) or its famous proteins (lamb meatballs, falafel). When we stopped by on a busy Tuesday around lunchtime, we instead got scant portions of toppings and almost half a bowl’s worth of black lentils, our “grain” of choice. Overall, the bowl’s flavors mixed well, and the lentils themselves were firm and served as a good base. Just be ready for the grain to be the star of the show. This year, Fuel celebrates 10 years of serving fresh food. (Happy birthday!) After a decade’s worth of business, its grain bowls are still tasty and loaded with protein. Whether you order the Thai Chicken or Tofu Bowl, the Sweet Potato Risotto Bowl, or the Gyro Bowl, you’ll be able to nourish your body and stay full. We are all about vegetable-heavy grain bowls, no matter what your preferred diet is. But, plant-based friends, we’ve always wondered: Is it really necessary to add substitutes for animal products to the mix? Can’t we just leave our feta cheez out and rely on the veggies to carry the dish? The answer from vegan chain Greens and Grains: No way. The New Jersey–based fast casual outlet utilizes fake meats and cheeses like coconut bacon and mozzarella cheez to great, filling effect in its savory bowls, to the point that we now go out of our way to stop by the Comcast Center for lunch. Despite the name, Muscle Maker Grill doesn’t only target gym rats. Its menu offers seven warm bowls with high-protein, low-carb, and gluten-free ingredients like grilled chicken, turkey bacon, brown rice, and reduced-fat cheese. The best part: All the bowls are portioned to just the right size, with no ingredient overpowering another. From the Turkey Chili Bowl to the Italian Godfather Bowl, Muscle Maker Grill is sure to satisfy anyone looking to eat healthier, especially while on the go. In addition to pitas, salads, and kebabs, Naf Naf Grill serves up savory Middle Eastern bowls. Once you decide between the turmeric-infused basmati rice or couscous as your base, choose your protein of chicken shawarma, grilled steak, or seasoned falafel, all of which are made in-house. To really up your bowl’s yumminess, add toppings and sauces like hummus, baba ghanoush, purple cabbage, pickled mango sauce, harissa, and tahini. No matter what you choose, you’ll be sure to get a bowl packed with warm, earthy flavors that will transport you to the Middle East with every bite. Real Food Eatery has it all: clean, all-natural ingredients, unique menu items, and a wide range of options. The current menu boasts nine diverse bowl options, all of which provide different flavor combinations. The signature bowl, the REF Classic Bowl, contains lemon herb chicken, brown rice, Parmesan roasted broccoli, roasted sweet potatoes, and sesame sauce, making for an unexpected yet nourishing combination. Other bowl options include Sriracha Meatball, Barbeque Steak, and Mediterranean Salmon. If you’re looking for a place where the grains reign supreme, head to Smart Street Healthy Kitchen and Juice Bar. Smart Street offers six different bowls, including the teriyaki-flavored Hibachi Bowl and the southwest-inspired Fiesta Bowl. No matter which bowl you choose, you only have two options for your bowl’s base: brown rice or quinoa. Don’t fret, though. Both bases absorb and enhance the flavors of the bowl’s ingredients, making you want to eat these grains for every meal. Sweetgreen has been dishing out simple, made-from-scratch salads and warm bowls since 2007. While we love their bowls that stay in rotation all year long (like the Chicken Pesto Parm Bowl and the Harvest Bowl), we really love the surprises that each season brings. Right now, you can get the spring-inspired Rustic Tomato Harvest Bowl, which tastes like chefs bought fresh produce from Reading Terminal Market and threw it all in, well, a bowl. The roasted tomatoes and onions give the dish a concentrated intensity while the goat cheese contributes a bright tartness.